Are Carrots Safe for Dogs? Carrots are an affordable, healthy snack for your four-legged friends. With so many commercial dog treats on the market, it’s no surprise that many pet owners are seeking healthy, nutritious—and, of course, affordable—treats for their dogs. That’s why more and more pet parents are opting to incorporate fruits and vegetables into their dog’s diet. Fortunately, one of the most affordable, lowest-calorie veggies is a safe, veterinarian-approved snack for your pup: carrots. A nutritious snack for both humans and dogs alike, carrots can make excellent treats for training and rewarding your pet’s good behavior because they don’t have the higher calorie count found in many commercial dog treats. Carrots contain virtually no fat, which means they’re an ideal choice for both older and overweight dogs. However, they are fairly high in sugar, so you don’t necessarily want to make carrots your dog’s go-to vegetable. As with all treats and supplemental foods, carrots should be offered to your pet in moderation, and with your veterinarian’s approval. 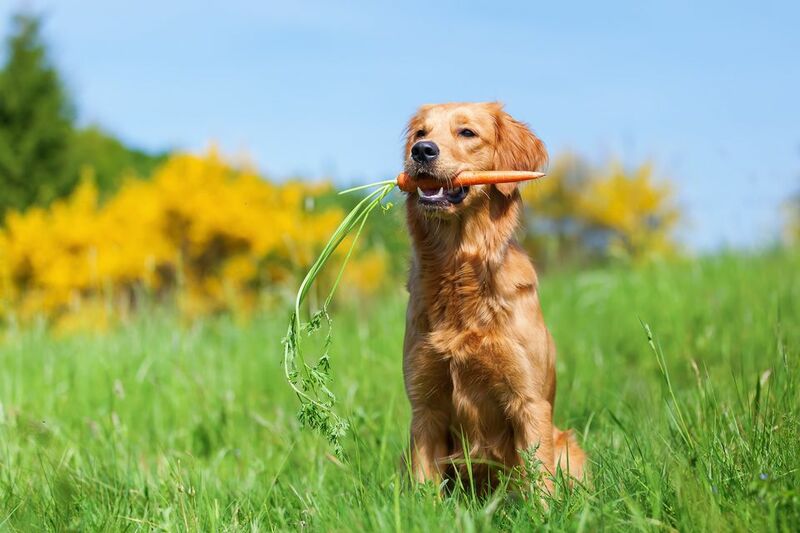 Because carrots are an excellent source of the antioxidants alpha-carotene and beta-carotene, which are converted to Vitamin A in the body, as well as potassium, fiber, and other vitamins, they can provide important health benefits for your four-legged friend. For starters, carrots are extremely rich in vitamin A, which can improve your pet’s vision and overall eye health; in fact, not getting enough vitamin A can lead to eye infections and even vision loss. Vitamin A can also help boost your pet’s immune system and keep their skin healthy. Carrots are also a good source of both Vitamin K, essential to blood clotting, and Vitamin B6, which helps turn carbohydrates, fats, and protein into energy. Lastly, the high fiber content of carrots also means they can help promote a healthy digestive tract and regular bowel movements for your pooch. It’s no surprise that many popular wet and dry dog foods and treats already contain carrots. While the amount of carrots present in your dog’s food won’t necessarily meet their total vitamin needs, they are a common addition in many dog food formulas because of their array of nutritional benefits. Better yet, chomping on raw carrots can also help improve your dog’s dental health. Carrots in their raw form can help dogs maintain strong teeth because of the amount of chewing it takes to eat them; these veggies can also act as a polishing agent to keep your four-legged friend’s smile clean and healthy. From raw to steamed, there are tons of preparations for carrots—and, more than likely, your dog will go gaga for this vegetable’s sweet flavor no matter how you serve them. Adding some pureed or juiced carrots to your dog’s foods and treats will provide a bit of sweetness and tons of extra nutritional value, and you can even bake carrots into homemade dog treats. While both raw and cooked carrots are generally considered to be safe options for dogs, it’s always a good idea to cut whole carrots—including carrot sticks—into bite-size chunks (or offer shaved carrots or baby carrots) before you let Fido go to town, as carrots can be a choking hazard when they aren’t cut properly, particularly for smaller dogs. However, a fully-grown medium or larger dog should be able to handle a whole, regular-sized carrot. To be on the safe side, be sure to monitor your pet when they’re snacking on a harder vegetable like carrots. Carrots can be offered both as a snack or training treat as well as an occasional addition to your dog's normal diet as a way to add a more nutritional punch to their kibble. Be sure that when preparing carrots for your dog, they are fully washed and/or peeled to remove any dirt or pesticides that could be harmful to your pet. Some veterinarians may even recommend popping carrots in the refrigerator or freezer and offering them to your puppies as a way to help relive teething pain and discomfort. For larger and older dogs, frozen carrots can make a great edible chew toy. As with introducing any “human” food into your pet’s diet, just be sure to touch base with your veterinarian with regards to feeding your dog carrots—and always ensure they are offered in moderation. Carrots contain cells that are surrounded by cellulose, which dogs can’t easily metabolize, so pet parents may want to consider pureeing the carrots in a blender to maximize their nutritional benefit. It’s why cooked carrots are ideal for dogs—steaming or boiling carrots allow the vegetable’s cellular walls to be broken down, allowing for a better absorption of vitamins and nutrients for your dog. When cooking and offering carrots, just be sure not to add butter, salt, or any other additives that can be harmful and unhealthy for your pet, as those types of ingredients can irritate your pet's stomach. Can My Dog Eat Tomatoes? Do Dogs Really Age Seven Years for Every One That We Age?